It is easy to look at uncleared forest land and visualize your new home in all its splendor, but it takes a lot of work and problem-solving before the physical universe bends to your will, if at all. Fortunately, we had a lot of help from competent contractors and I have described their services in my earlier posts on Building/moving to a new home. The before and during shots at the top of this article show our driveway from the road before construction of the house and workshop. We were building these during the winter, so we ended up with a two-lane driveway using enough rock and gravel to run heavy trucks and a crane in and out. When all of the excitement died down, I had Michael Shortt, our excavating contractor, trim the driveway back down to a single lane with a nice serpentine design. 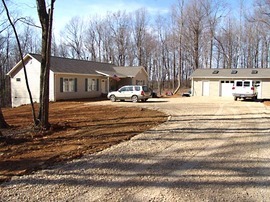 The shot at right is the driveway leading up to the house and workshop as of April 2006. Gretchen picked out a top coat of limestone gravel from Christiansburg which is called crusher run by local contractors. This is a mixture of gravel and finer particles of dirt that pack down and become a stable topcoat over time. It is the same material that is used to cover unpaved roads in this area and it stands up very well in all kinds of weather. These before and after shots were taken from the parking area near the workshop and show the serpentine effect we finally achieved. When the ruts in the driveway are removed and plantings line the driveway it should result in a graceful entryway. Of course, once you have a gravel driveway, you need to roll it to maintain its appearance. 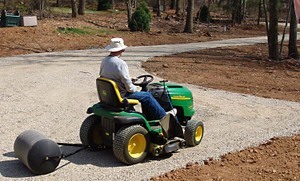 Our good neighbor, Doug Thompson brought over his John Deere lawn tractor and I rolled our new driveway in less than an hour. These little tractors are great fun, almost addictive. It was a shock to me to see our lovely wooded lot cleared for our house. I had hoped to keep some of the trees. But we had one of our clients do it as a reciprocity deal, so we couldn’t say much. Buy a John Deere 2305. It’s the smallest tractor that JD makes but it’s rugged, 4WD, and approximately the same size as JD’s largest riding lawnmower. Last year I bought the 2210 w/ a loader and a 62″ belly mower for $13,500. You can pay cash or go with their 36 month 0% financing package for homeowners. It’s center of gravity is lower than a riding lawn mower of similar size because the engine is mounted lower, and it is safer to mow slopes with. The rollers are useful for doing light maintenance but after a strong rainstorm or two you may have rivulets and erosion best left to the 2305’s bucket or a box blade. Get a box blade for your road, don’t bother with a rear landscape blade, they can do more harm than good. The iMATCH adapter is $150 and then you can use iMATCH compatible attachments, meaning you don’t have to get off the tractor to switch attachments – it’s very handy. The 2305 is not a big heavy duty tractor, but it’s still heavy duty. I’ve dug out tree stumps with mine and the bucket is very handy for mulch, hauling logs, and so on. The belly mower is top-notch, I mow 5+ acres of lawn with it, with lots of slopes and have never come close to tipping it over. It’s relatively easy to remove and attach the belly mower especially in a shop. The turning radius in 2WD is 22″! I’ve got a John Deere 3520 w/ 300CX loader, a John Deer 2210 w/ 200CX loader, a John Deere HPX Gator w/ ROP bars, a Frontier rear blade, a Frontier landscape rake, the John Deere C21 wagon……. I know all about the euphoria of land management tools acquisition 🙂 Next on my list is the 600lb rear broadcast spreader, a spike aerator, the LX6 rotary mower, and….. Haha.